Bundesliga outfit VfB Stuttgart have confirmed Aston Villa midfielder Thomas Hitzlsperger has signed a two-year contract to join them in the summer. 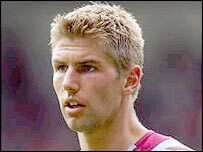 Hitzlsperger, 23, is out of contract at Villa at the end of the season. The German international turned down a contract offer from Bayern Munich to join Villa when he was 18 and has made almost 100 appearances for the club. He said: "I decided to join Stuttgart because I got a good feeling after talking with the management." Hitzlsperger made his international debut for Germany in 2004 against Iran. The midfielder nicknamed "the Hammer" for his powerful shooting skills has made little secret of his desire to return to Germany to strengthen his World Cup hopes when the country hosts the tournament next year. Stuttgart coach Matthias Sammer said: "Thomas is a young player who cut the grade in England and has a lot of potential. "We're happy he decided on VfB and we're convinced Thomas can continue his positive development of the last few years when he comes to Stuttgart." Stuttgart chairman Erwin Staudt told his club's website: "The signing is a signal for the team and our fans. "Our goal is clear, we want to qualify for the Champions League and systematically reinforce our team." Hitzlsperger's decision to join Stuttgart comes soon after Villa chairman Doug Ellis pledged around £20m to manager David O'Leary for close-season team-building.